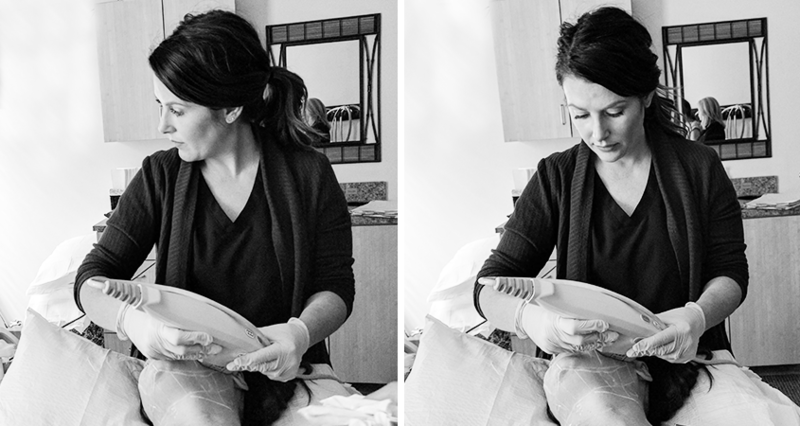 Ultherapy administers focused ultrasound energy to the treatment area. The sound energy passes through the superficial layers of the skin to target the deeper, foundational area where collagen production occurs. Here, the sound energy triggers a process called neocollagenesis, the increased production of new collagen. Over time, this increase produces a noticeably rejuvenated, uplifted look. 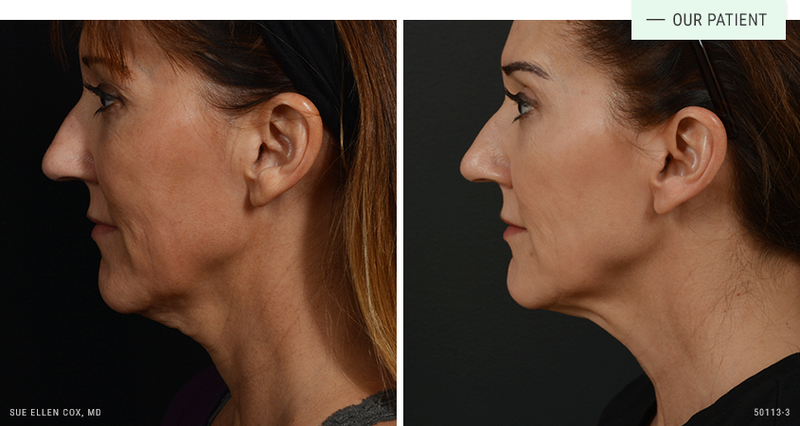 Before | After: One Ultherapy treatment to lift tighten sagging skin along the jawline. 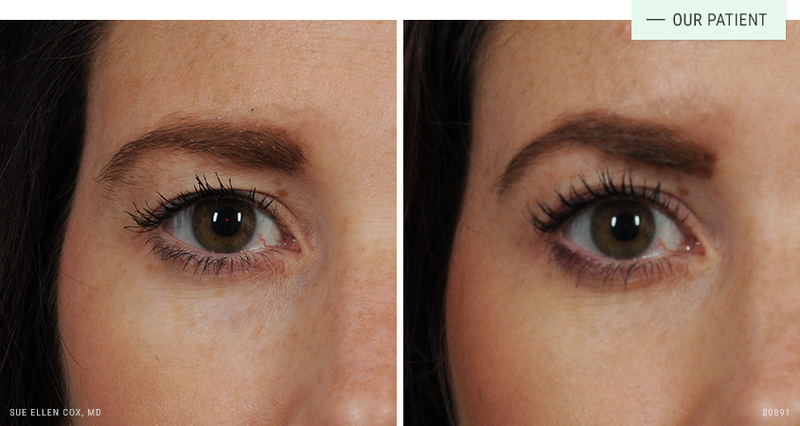 Before | After: This patient received one Ultherapy treatment to the brow, making the eyes look larger and more wakeful. 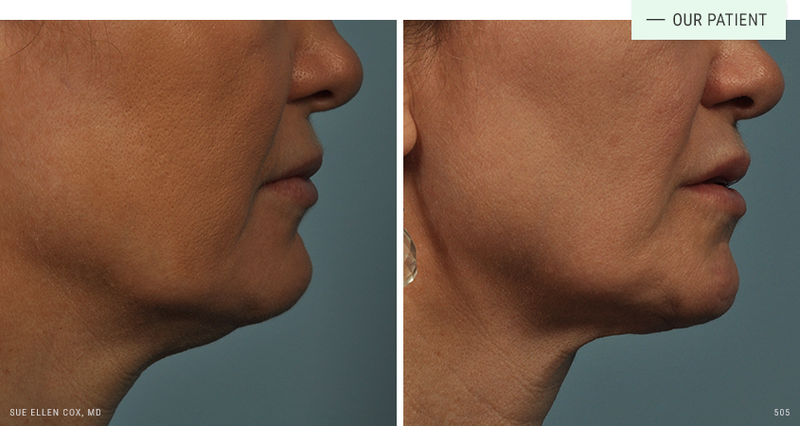 Before | After: Ultherapy can be used to tighten the full face and skin under the chin and along the jawline. Expertise: Cosmetologist Kim Forster is our Ultherapy expert. She has advanced training and can perform advanced protocols. The FDA has cleared Ultherapy to safely treat skin laxity. It has an excellent safety profile. Like any medical procedure, there are risks. As a teacher and trainer of other physicians in laser and energy procedures, Dr. Cox stresses the importance of finding an experienced provider directly supervised by an on-site physician who understands the finer points of ultrasound treatment. Ultherapy is well tolerated. Comfort measures are developed for each patient based on the treatment plan. We typically provide medication to help you relax prior to treatment. During treatment, the Ultherapy applicator administers focused sound energy to the foundational layers of the skin. The length of the procedure depends on the areas being treated, ranging from 30-60 minutes. Patients may experience the sensation as warmth or heat, a deep vibration or tingling, or as pain or discomfort. If relaxation or pain control drugs are administered, you will need a driver to take you home. Ultherapy requires limited downtime. Immediately after the procedure, most patients experience some redness and flushing. The most common side effects are slight swelling, bruising, tingling, temporary numbness or tenderness to the touch. Most patients go home after the procedure to rest and are able to return to normal activities the following day. Ultherapy stimulates collagen to effectively treat mild skin laxity of the face and neck. Ultherapy is FDA cleared to tighten and lift the brow, midface, jawline, neck and chest. Results develop over several months as the increased collagen production improves tone, tightness and texture. Patients are typically happy with results from one treatment, although a series of treatments may be required to best address certain concerns. Immediate and noticeable results, pain was minimal. I saw Dr. Cox for the initial consult. She described the procedure and intended outcome, and took the time to answer my questions. Kim Forster performed the procedure. I got the impression that Kim does a lot of Ultherapy treatments, as she seemed to be very comfortable with the machine and process. She told me what to expect, how much pain I might experience, what the machine was doing, etc.